* As another snowstorm rolls across the country,enjoy a cup of cozy warm Matcha Green Tea latte. Loaded with antioxidants it can lower cholesterol and even boost metabolism. 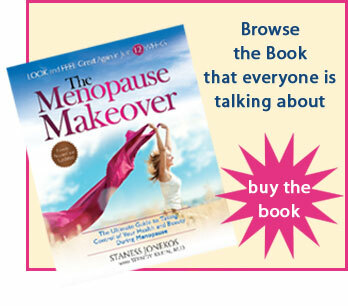 Staness Jonekos of Menopause Makeover shares her favorite, easy to prepare recipe. * Mirabai of Moving Free with Mirabai wants you to learn how cardio dance may improve memory. * Would you try the newest ‘ backwards hair craze’ that Jackie from Aging Backwards discovered. * Is age appropriate dressing all in your head? Deb Boland of Fabulous After Forty explores why dressing age appropriately may not be all its cracked up to be. * Positive Aging Expert Barbara Hannah Grufferman of the Best of Everything After Fifty wants women to stop spending so much money on health and beauty treatments and instead go shopping in their kitchens to look gorgeous and feel great. * Are you one of those lucky ones that is getting away for the winter? Even if you’re not, you need to check out this fabulous giveaway that Fab Over Forty has going on! Enter to win a travel T3 hair dryer and stylish hair ties perfect for the gym or the winter giveaway. * Jodell at Black Cat Plus checks out Oscar fashion styles that work for plus size silouettes. * And at No-Nonsense Beauty Blog you can now download a FREE four page guide to Retin A when you subscribe to the blog. It explains how this powerful anti-ager works, how to choose the right formulation for your skin needs, offers a day and night Retin A treatment plan and answers the five top Retin A questions. Just click the little envelope, on the right hand side of the homepage. One click and you will become a Retin A zen master. FYI if you are reading this blog on an I Pad or smartphone, the box will be at the bottom of the page.